LikeSo is for your next presentation, interview, meeting, audition, date, debate – even your next conversation! 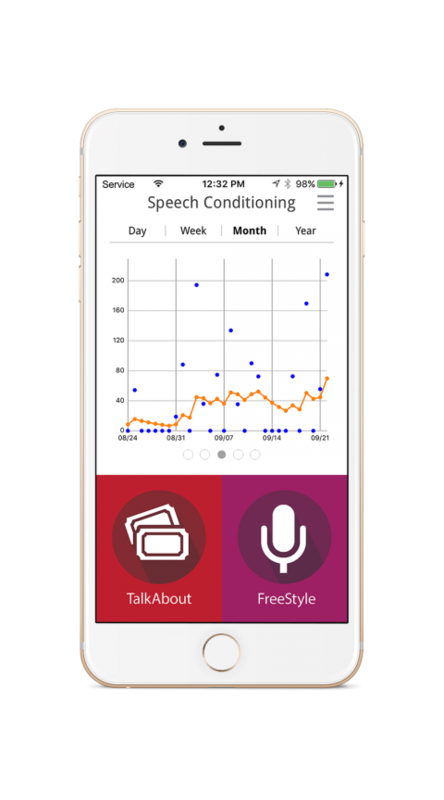 With two modes of play: FreeStyle, your own open mic, and TalkAbout, a conversation game to practice speaking on the fly, LikeSo provides a real-time analysis of your speech fitness, including your use of filler words and optimal pacing for the fast or slow talker. Using voice recognition technology, LikeSo provides you with real-time analysis of your speech fitness and calculates a score based on the number of filler words (“like,” “ya know,” “totally,” “I mean,” “so,” “actually,” “okay,” “whatever,” etc.) and how fast or slowly you speak. The more you practice, the more articulate you will become! Tethered to our smartphones, and with so many social channels to communicate on, we reduce our opportunity to have articulate, substantive, face-to-face conversations. With LikeSo, we want to turn our smartphone addiction into a solution! LikeSo is serving up speech fitness training for measuring, monitoring and motivating improvement in our speaking skills! Set Goals and Reminders for upcoming speaking opportunities. Earn Speech Quality Points and see your Speech Conditioning Score progress and improve over time. FreeStyle offers an open mic for you to practice your next presentation, toast or other speaking engagement. Say it LikeSo! Download Today! "As someone prone to awkward silences and sweaty armpits at the mere thought of social interaction, this app is a lifesaver. I love the FreeStyle feature to practice my presentations for school, and the TalkAbout feature proves invaluable for social events with parents and peers. It’s basically saving my high school career for oral presentations." "Wow, was introduced to LikeSo @The Girls’ Lounge in NYC and I see so many applications for its use: career building, speech practice, STEM proposals, self-awareness goals and oral presentations!" Improve your speaking ability. Download Today!